Though Daniel Island is a collection of carefully planned communities, considerable work has gone into maintaining the rural feel of the island, leaving large thickets of Spanish moss draped live oak and towering palmetto trees untouched, giving the newly developed island a well-established look and feel. 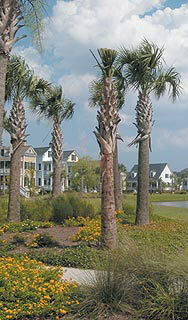 Homes are set close to the quiet meandering streets to help give residents that neighborly feel. The island features several spacious parks with playgrounds and open grassy spaces, and is home to the newly completed Tom Fazio golf course that is rapidly getting a reputation as one of the best courses in the area. The island is also home to some of the top names in women’s tennis who compete each April in the Family Circle Cup at the Family Circle Tennis Center. The newly constructed tennis stadium also hosts Davis Cup matches, local competitions, and is a favorite venue for concerts. The island is also home to Blackbaud Stadium, one of the country’s premier soccer specific stadiums and the home ground for the 2003 A-League champions Charleston Battery. Just minutes from Mount Pleasant and downtown Charleston, area beaches and the Wando River, Daniel Island’s prime location offers residents almost unlimited recreational and cultural opportunities, making it ideal for families and retirees.